We are Born with Naked Hearts: Thriving in Vulnerability. I can completely understand why we are terrified of this word. Most of us have become vulnerable in our life but usually not by choice. Our walls come down in a relationship, at a job, and we get burned; sometimes badly. Our whole perception of vulnerability is that it causes pain, and why would we want to do something that intentionally causes us pain? What we don’t look at is the power of vulnerability. The shedding of layers, of that hard shell that protects all of our feelings, our ego, and we are afraid of being authentic, we are afraid to get naked. We forget to look at the light that can come from choosing to be completely open. There are many times where I second guess publishing my writings for all my friends and the world to read. I pour my heart out in my words and it is not an easy task to welcome others into our world. It takes a lot of self love to be vulnerable, which is a b*tch of a task on its own. Don’t feel. Don’t expose. Don’t open. Don’t be vulnerable. When I wrote my first article this year, my hands were shaking with fear, fear that people would reject my words, fear that I would get in trouble. But still, I posted my heart to the world—as if I had ripped it out of my chest and stapled it to a bulletin board, for everyone to see. I was so naked. Completely stripped. Totally vulnerable, but this time by choice. Every single part of my mind, body, and soul told me yes, yes, yes! This is what can come from a vulnerable state. We can touch people with our words, with our actions, as long as they are authentic. We connect when we are completely open. We are able to create spaces where we are safe. We truly thrive when we can find this space of vulnerability. There is always a chance of pain in life. There is always a change for an amazing, eye opening, heart warming experience, and if we settle for no, if we stay closed our whole life, how will we ever discover that? 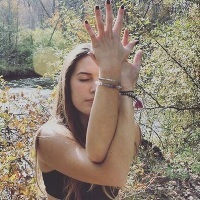 Anjali Romaniuk is an aspiring yoga teacher and acupuncture student based in Detroit, Michigan. Her goal is to help people have a healthy connection to being vulnerable and creating a space to not only explore practice on the mat, but to develop tools to bring the same awareness into the real world. Connect with Anjali via Instagram.